Business relations between Desiree Haftstein - Knauer Elektronik (hereafter called Knauer Elektronik) and a customer are exclusively subject to the general terms and provisions as below in the version which is valid at the time the order is placed. The contractual language for business relations with foreign customers is German or English. Customers in terms of these general terms and conditions are consumers, entrepreneurs as well as other legal or natural persons. "Entrepreneurs" in terms of these general terms and conditions is any natural or legal person who concludes with Knauer Elektronik a legal transaction for a purpose which can be attributed to his/her commercial or freelance occupational activity. Knauer Elektronik is obliged to accept the customer's order according to the terms of the website. Knauer Elektronik will confirm the receipt of the order immediately by email. The confirmation of receipt does not constitute a binding acceptance of the order. When dealing with consumer's the purchase contract is effective upon delivery of the goods, in any other case at the handover to the shipper, carrier or other for the transport contracted third party. Placing the order by the customer does not conclude a purchase contract between the customer and Knauer Elektronik. In case the customer pays by "prepayment / cash before delivery" or by "PayPal", the contract of purchase becomes effective by sending the order-confirmation and the request for payment. At all sendings to consumer's Knauer Elektronik bears the risk of transportation. If the addressee is not consumer in terms of these terms and conditions, the risk shall pass to the customer when the goods are handed over to the forwarder or carrier, latest, however, when leaving our warehouse. (§ 447 BGB). The consumer (§ 13 BGB) is entitled on a right of withdrawal according § 355 BGB. Customers, who are not consumers in terms of these terms and conditions are entitled to a voluntary right of return within 14 days after receiption of the goods, whereas the customer has to bear the costs and the risk of return. As for customers who are not consumers and special offers are excluded from the voluntary right of return. You have the right to return the goods without stating any reason within 14 days as of receipt of the goods by sending back the goods. The 14-day revocation period starts from the day when you or a person entitled by you who is not the carrier, takes posession of the goods. To revoke your order you must give an explicit statement (e.g. in writing as letter, fax or email), that you want to revoke the contract. You can use the attached sample revocation form, but you are not obliged to use it. You can fill out the sample revocation form or sent an other clear statement electronically. If you sent the revocation electronically we will confirm the revocation upon receipt. The revocation must be sent before the expiration of the revocation time limit. In case of an effective revocation, any performance received by one party is to be returned to the respective other, as are benefits derived from such performance, e.g. interest, except additional costs which exceed the standard shipping costs. Obligatory refunds of payments must be made within 14 days after sending the revocation. We will not charge any fees for returning goods. Repayment will be made by using the same mode of payment as at the original transaction. Knauer Elektronik is entitled to retard the repayment upon reception of the goods or an evidence dispatch of the goods, whatever is the earliest date. You have to return the goods to the above address within 14 days upon sending your statement of revocation. The term is kept if the goods are dispatched within that period. You have to bear the direct costs of return. If you cannot return the goods received in whole or in part or if purchaser can only return the received goods in a deteriorated state, you must pay compensation for value insofar. There is no duty to pay compensation for value, if the sole cause of deterioration of the goods received was the inspection of the respective goods, as would have been possible in a retail shop. Please avoid damage and contamination of the product. Send the product with all packaging components to us if possible. Use a protective outer packaging. Provide us with an appropriate packaging for adequate protection from damage during transit. Please do not send the product unfree to us back. All prices incl. VAT plus shipping rates and possibly shipping fees. The cost for shipping and handling are included in the respective offer . 5.1 Shipping costs are recognized in the respective item description. When ordering by COD separate fees may apply. The level of fees is stated in the article description. For orders via cash on delivery service additional, separately cash on delivery fees will be charged. This collection fee is done on behalf of DHL and will not be shown on the invoice. 5.2 If the customer is a consumer the seller bears regardless of the delivery the transit risk in any case. If the customer is an entrepreneur all risks and dangers of the shipment transferred to the customer once the goods have been transferred from the seller to the logistics contractor. Depending on destination of delivery and total of order the customer will be able to select at the order process different modes of payment. Customers may pay by prepayment (cash before delivery) and PayPal. Notes and checks are only accepted for payment purposes. All associated costs and expenses are charged to the customer. 6.1 In case prepayment is agreed upon, such payment shall be due immediately after conclusion of contract. 6.2 If you select the payment method 'PayPal' you will be redirected with your order specifications to the PayPal website, where you can make your payment. The delivered goods shall remain the property of Knauer Elektronik until complete payment of the purchase price. The statutory warranty conditions shall apply. The warranty period for the consumer after delivery of new products is 24 month and in all other cases 12 month. For any defects or problems with the item that appear before the expiration of the legal warranty, the customer may choose any of the actions to which he/she is entitled: supplementary performance in the form of repair/product replacement, as well as assuming all legal requirements have been fulfilled further entitlement to a reduction in the price, withdrawal from the purchase contract, and/or for compensation of damages including related futile expenditure. The customer is asked to claim the delivered goods with obvious transport damage to the deliverer and to inform the seller accordingly. If the customer fails to comply it has no effect on his legal or contractual warranty claims. Solely german law shall be applicable by exclusion of the UN Purchase Law. In case the private end-consumer is a non-EU resident, is our venue of jurisdiction. At business dealings with consumers, the law applicable to the consumer's place of jurisdiction is valid as long as it unambiguously deals with provisions for consumer rights. This information is intended solely for informational purposes; the original German text is legally binding. Knauer Elektronik specializes in a wide variety of connectors. 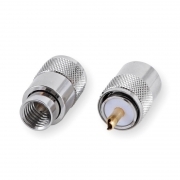 Especially in the field of amateur radio, we offer our customers a wide range of high frequency (HF) connectors and adapters of various standards. 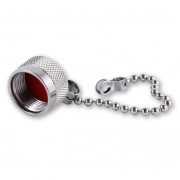 The best known among them are the BNC, UHF (or PL), N and SMA standard. In addition, we also offer numerous connectors for measuring and testing, such as banana plugs and battery terminals. In the field of audio we are represented by RCA, jacks and DIN connectors. 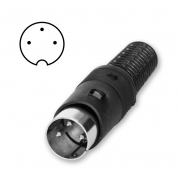 Also in the automotive sector, we can provide you with the cigarette lighter plug sockets. 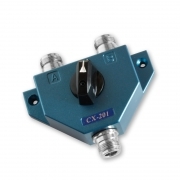 In addition to our connectors we also offer assembled cable bridges with various coaxial cable and connectors, as well as in a variety of lengths. The product range is constantly being expanded. Have a look at our current and changing Promotions. Our newsletter informs you about new products and discount campaigns. * All prices incl. VAT plus shipping rates and possibly shipping fees unless otherwise stated. Delivery is usually within 3-4 business days. All prices are per piece.